The fun is about to unroll. Here's your invitation to join in with RockingChairQuilts.com and celebrate the mighty Jelly Roll. Many thanks to the folks at Moda Fabrics and Supplies for hosting this awesome event. We are going to get started with the fun TODAY. Let's be real, a Moda Jelly Roll® is already fun. Wait.... we already know that those are all intrinsic qualities of a Jelly Roll, but what about that 5th one, "It's fun to win" ? Rocking Chair Quilts has got you covered on that. Prizes are always fun and why not a Jelly Roll prize? Why not TWENTY Jelly Roll prizes? That's right we are going to give away 20 Moda Jelly rolls to celebrate National Jelly Roll Day on 9-15-2018. To enter for your chance to win a Moda Jelly Roll read on. HOW CAN I ENTER TO WIN A JELLY ROLL? Leave your comment on this blog post (below) to enter. What should you comment about? Add add a another word to our jelly-roll glossary. Tell us about your favorite snack to eat and share when you are quilting or with sewing friends. Here are the 10 winners selected from all the online entries, Congratulations to all! I'm going to make some pinwheel cookies for the big day. What will you make? We woke up this morning with the happy realization that the first annual National Jelly Roll Day had finally arrived. A banner day was thoroughly enjoyed by everyone here at RCQ and all our guests. A BIG thank you to Brigette Heiland of Zen Chic and Moda for providing these NSAJRD patterns. Cut strips 4 1/2" long. Use with 2 1/2" squares (Moda Candy squares work great) to create scrappy Flying Geese blocks. Sew strips together for a scrappy back. Make "framed" 9-patch blocks (1 Jelly Roll strip is enough to frame a 6" finished 9-patch. 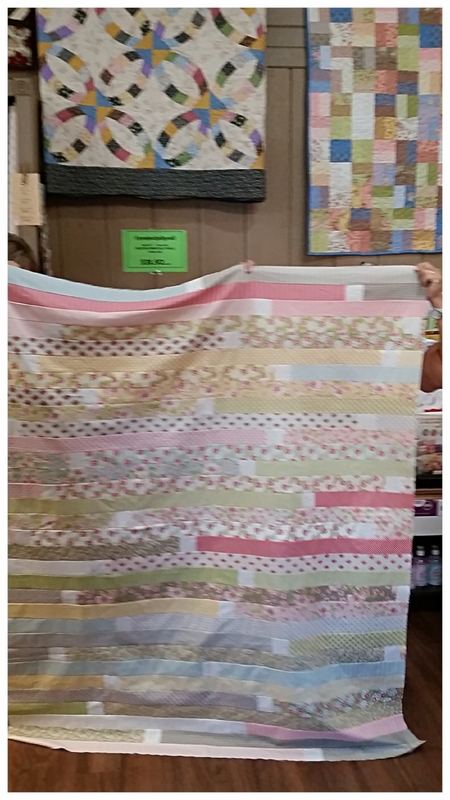 Make a "coins" quilt using left over Jelly Roll pieces. Make piano key borders for a scrappy quilt. Make kitchen accessories: pot holders, place mats, mug rugs, or coasters. Make scrappy binding by cutting Jelly Roll strips into fourths and then sewing together as many pieces as needed for the length desired. 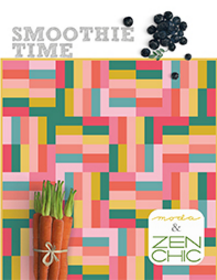 HERE ARE YOUR FREE PATTERNS courtesy of zen chic and moda fabrics - HOO-RAY! Post pictures of any Jelly Roll projects you are working on (or even the ones that you finish ) on Facebook , Instagram, Twitter. Use the #projectjellyroll to share your fun with everyone who enjoys a Moda Jelly Roll. Lots of jelly roll patterns there, all free for you to enjoy. We enjoyed some yummy Jelly Roll themed snacks here at the quilt shop today. If you got too busy to stop by ( or just live somewhere else in the world ) we thought it would be nice to share the recipes here. Thank you Kathy for bringning us cookies!